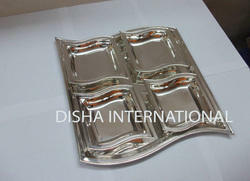 We are manufacturer and exporter of Sterling Silver and Silver Plated Trays, Bowls and Sets. We have many different designs of the tray sets. All are hand made sets. A beautiful gift set for someone very close to your heart. Set comes in a nice velvet gift box. In tunes with advanced market development, we are offering a wide range of Tray Bowl Set. These Bowl Set are offered in variety of designs, shapes, sizes. Our assortment of sets are available at market leading prices. We are offering customized products. With a precise understanding of the relevant industry, we introduce ourselves as the leading manufacturer, exporter and supplier of Tray Bowl Set which is designed for special occasions. The provided set is manufactured by our skilled professionals using the finest quality silver metal and cutting edge technology. Further, we check this set on different parameters before it is delivered to our clients in order to make sure that this is in line with industry norms. We are offering customized products.